Tomorrow is Thanksgiving Day, but it is also the feast of St. Cecilia, a very special saint in My Domestic Church as we are all musicians! St. Cecilia was so highly venerated that she is actually called out in the first Eucharistic prayer of the church. We hear that one as often in my parish at certain high points in the liturgical year! 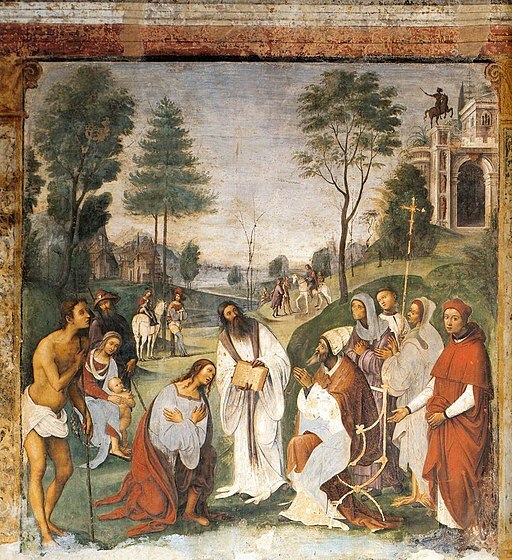 For ourselves, too, we ask some share in the fellowship of your apostles and martyrs, with John the Baptist, Stephen, Matthias, Barnabas, [Ignatius, Alexander, Marcellinus, Peter, Felicity, Perpetua, Agatha, Lucy, Agnes, Cecilia, Anastasia] and all the saints. Though we are sinners, we trust in your mercy and love. Do not consider what we truly deserve, but grant us your forgiveness. Through Christ our Lord. Read the Legend of St. Cecilia for free online here. 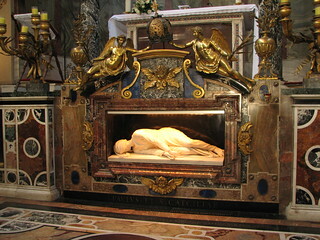 St. Cecilia is one of the famous virgin saints of the church. She had vowed to remain a virgin The story goes that a young man named Valerian fell in love with her and asked her parents for her hand in marriage. On their wedding night, Cecilia confided in Valerian. "I h ave an angel which thus loveth me - That with great ove, whether I wake or sleep, Is ready, aye, my body for to keep." Chaucer, "Second Nonnes Tale"
This must have at least intrigued Valerian because he said he would believe her only if he could see the angel. Cecilia told him that he would only be able to see the angel if he himself was baptized first. We have no idea how much time passed, but Valerian was baptized by Pope Urban I (the great converter). When Valerian returned to his bride, "He found Cecilia in her little room lost in prayer, and next to her the angel of the Lord was standing. When Valerian saw the angel, he was seized with great terror." 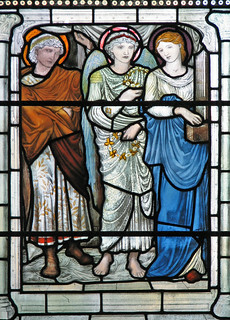 The Wedding of St. Cecilia by Father Lawrence Lew, OP, via Flickr. Licensed cc. Interestingly, the angel gave Cecilia a bouquet of red and white roses. The white symbolized chastity and the red love, although it also portends her martyrdom. There really exists today a St. Celia rose that is white with a blush of red. 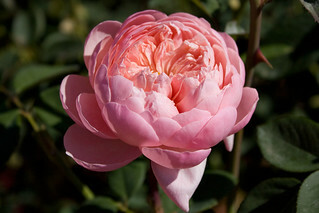 It's considered one of the finer English roses. So powerful was Valerian's conversion, he was able to convert his brother Tiburtius. When Tiburtius saw the beautiful flowers and heard the story of their origin, he asked to be baptized too. But eventually, the story of these three young Christians reached the ears of the prefect, Almachius. He ordered his soldier, Maximus, to arrest them all. The night before their execution, Cecilia, Valerian, and Tiburtius shared their faith with Maximus. He was converted along with his family. St. Valerian, St. Tiburtius, and St. Maximus share a feast day on April 14. St. Cecilia did not have a pleasant death. After an attempt at suffocation failed, an executioner made three attempts to behead her. She lived for three days before succumbing to her injuries. Father Lawrence Lew, OP, via Flickr, licensed cc From the Shrine of St. Cecilia. 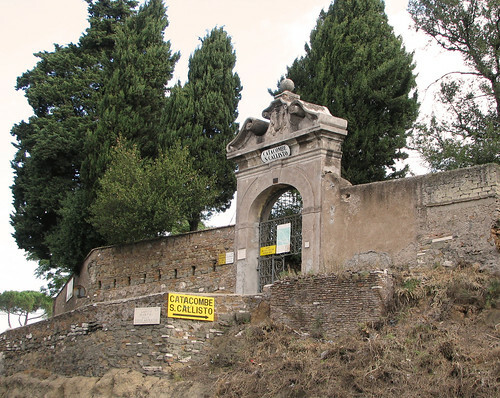 Entrance to San Callisto's catacomb where St. Cecilia was buried. Saint Cecilia: Patron Saint of Church Music: "Along with St. Catherine, St. Cecilia is considered one of the muses of poetic art. This fact helps to explain why she so often appears in art. Another reason St. Cecilia appears widely in art is that artists like to work with the 'rapt expression' associated with St. Cecilia's facial expressions (Jameson 345). St. Cecilia, however, is confined mainly to Western art. The oldest known artwork of St. Cecilia is a rude drawing on the wall of a catacomb at San Lorenzo, which dates from 817 AD (Jameson 349). Another well-known piece of art with Cecilia as the subject is the sculpture 'St. Cecilia Lying Dead.' It was commissioned by Cardinal Sfondrati to commemorate the attitude in which she was found (Jameson 347). Sir Charles Bell describes the statue: The body lies on its side, the limbs a little drawn up; the hands are delicate and fine,--they are not locked, but crossed at the wrist: the arms are stretched out. The drapery is beautifully modeled, and modestly covers the limbs. The head is enveloped in linen, but the general form is seen... (Jameson 347).In the late fifteenth century, St. Cecilia begins to be associated with music. 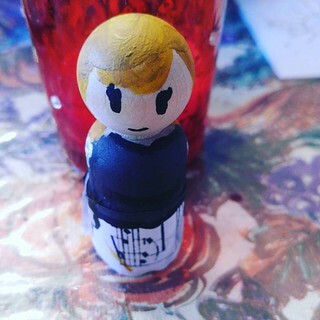 Artists begin to portray her with an organ or singing. Artists also like to paint her with cherubim at this point. 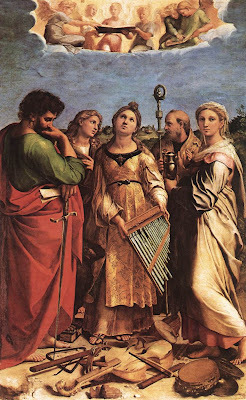 Before her association with music, St. Cecilia was portrayed with a palm in one hand and the gospel often in the other. She was also often depicted wearing either the martyr's crown or a crown of roses (Jameson 351). The most celebrated modern representation of the virgin saint is the painting by Raphael. 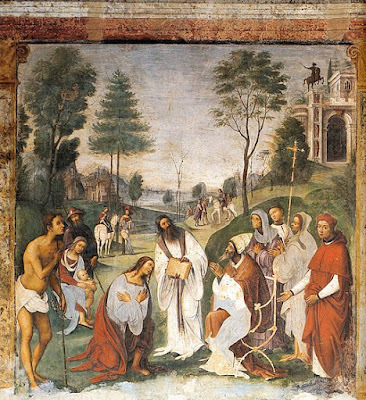 It was commissioned as the altar piece for her chapel in the church of San Giovanni-in-Monte near Bologne (Jameson 350-51). Sing to him a new song, sing to him with joyful melody. Every one of us tries to discover how to sing to God. You must sing to him, but you must sing well. He does not want your voice to come harshly to his ears, so sing well, brothers! If you were asked, “Sing to please this musician,” you would not like to do so without having taken some instruction in music, because you would not like to offend an expert in the art. An untrained listener does not notice the faults a musician would point out to you. Who, then, will offer to sing well for God, the great artist whose discrimination is faultless, whose attention is on the minutest detail, whose ear nothing escapes? When will you be able to offer him a perfect performance that you will in no way displease such a supremely discerning listener? See how he himself provides you with a way of singing. Do not search for words, as if you could find a lyric which would give God pleasure. 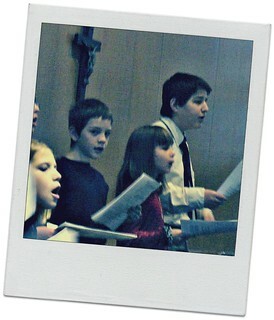 Sing to him “with songs of joy.” This is singing well to God, just singing with songs of joy. But how is this done? You must first understand that words cannot express the things that are sung by the heart. Take the case of people singing while harvesting in the fields or in the vineyards or when any other strenuous work is in progress. Although they begin by giving expression to their happiness in sung words, yet shortly there is a change. As if so happy that words can no longer express what they feel, they discard the restricting syllables. They burst out into a simple sound of joy, of jubilation. Such a cry of joy is a sound signifying that the heart is bringing to birth what it cannot utter in words. Now, who is more worthy of such a cry of jubilation than God himself, whom all words fail to describe? If words will not serve, and yet you must not remain silent, what else can you do but cry out for joy? Your heart must rejoice beyond words, soaring into an immensity of gladness, unrestrained by syllabic bonds. Sing to him with songs of joy.